While the crisp and clean recording that digital music allows for is great for perfect reproduction, there’s something to be said for the snaps, crackles, and pops of an old record in play. Read on as we show you how to mimic the sound of an old record with your digital music collection. I grew up listening to records with both my parents and grandparents, and I’d really like to recapture that sound of that experience even though the record players and the records themselves are long gone. I know I could always get an actual record player and hunt down some old records, but I already own a lot of the music that I grew up listening to in digital form. Is there anyway I can recreate the whole hiss-and-pop bit that comes with playing old records on a turntable with my actual music collection? I’m open to any ideas or suggestions you might have! Thanks so much guys! Although the hiss and pop of old records is actually the result of dirt, grime, and scratches on the record (and was historically considered problematic because it distorted the actual recording) we absolutely get where you’re coming from. Despite the fact that the dirty-record noise weren’t intended to be part of the listening experience they were part of the record listening experience and they’re as much a part of our memories of listening to old and playworn records as they are of yours. Fortunately we’re not alone in our fond memories of that quintessential “vinyl sound”; multiple developers and enthusiasts have created a variety of ways to recreate the sound of old records both temporarily (with a layover sound effect) and permanently (by editing the sound file itself). Let’s take a look at some of these tricks in order of both ease-of-use and how permanent they are. This will give you (and any readers following along at home) a chance to see if they really want the sound before committing to the project. Over at MyNoise.net they have a handy “Dust ‘n Scratches” sound generator you can use to add background sound effects to your music. This is a great solution because not only is it free, temporary, and easy to use, but you can layer it over any other sound on your system. You simply open up the webapp in your web browser and then play any other sound source on your computer. It could be a YouTube video, an MP3, or even the sounds from a video game. The generator sounds simply layer over the existing sounds on the system in a completely temporary way. Further it’s easy to adjust the sound generator. It comes with a variety of presets that mimic various playback setups (LPs, 78s, very scratched, dusty, even the end-of-groove sound effect). You can close it at any time and resume listening to your music without the hiss and pop if you decide you don’t care for it. If you take your music with you and you’d like the same kind of layer-over effect we just highlighted there are several solutions for both iOS and Android worth looking at. MyNoise, in fact, has a free iOS app that comes with a handful of sound generators (and each additional generator is 99 cents). You can pick up the vinyl sound generator for a buck and enjoy the exact same experience you have with the web app anywhere. Like the web app the process is nondestructive and layers right over your existing music. Other iOS apps that accomplish the same sound effects (as well as add in other features like album art and management) are VinylLove ($0.99) and AirVinyl ($0.99). 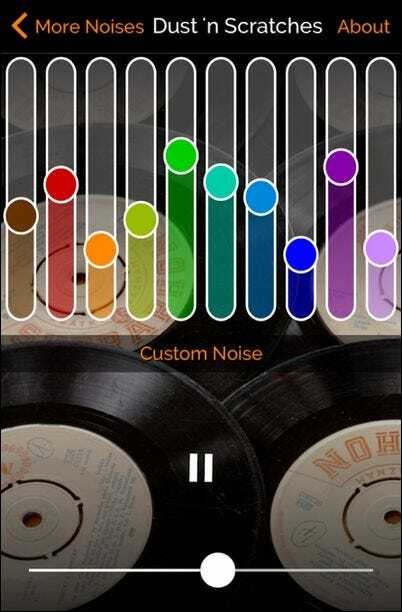 If you’re on Android you can check out Vinyl Player (free); unfortunately there are a ton of apps on Android devoted to virtual turntables (for mixing/DJ work) but only one app we could dig up that focused on actually creating vinyl sound effects. Again, for emphasis, all of the mobile apps we’ve recommended here are nondestructive. 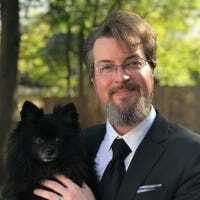 They make no changes to your actual sound files and the sound effects only occur while the application is running in parallel with your music playback. Layering the sound effects over your music is easy to do and doesn’t permanently change the music but what if you want to make a copy of your music with the effects permanently applied? While we could never recommend editing your only files (such as the original rip of a CD that you no longer own) there are more than a few reasons you might want to make a copy and apply the vinyl effects permanently. Let’s say, for example, you wanted to create a burned CD of an MP3 album to play in your car with the vinyl sound effects. In order to do that you’d need to remix the entire album with the sound effects added to the tracks before burning the CD. Although the process is pretty straight forward there are two points where things can go frustratingly wrong. First, you need to grab a copy of Audacity that is older than the current 2.1.0 version. There is a bug in the current version of Audacity wherein the Register Effects menu (which prompts you to install the VST plugin) freezes when the Vinyl plugin requests authorization credentials. Download version 2.0.6 here; you can upgrade to the most current version after installing the plugin. Second, you need to use a valid email address for the Vinyl plugin’s registration page because they’ll send you a registration code. The plugin is free, but it won’t work without that code. To prepare download and install both Audacity and Vinyl from the links above. Once they are both installed run Audacity. 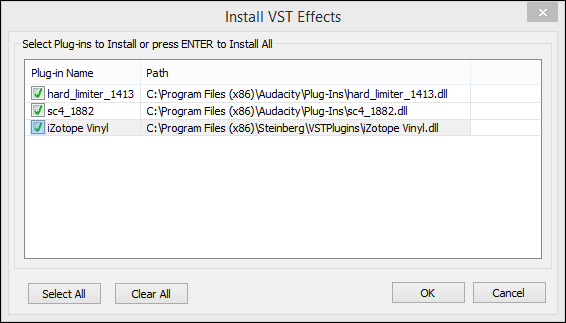 You should be prompted to automatically register the Vinyl plugins as seen below. When prompted, plugin the registration credentials emailed to you by iZotope. Load up the MP3 or other digital file you wish to edit in Audacity. 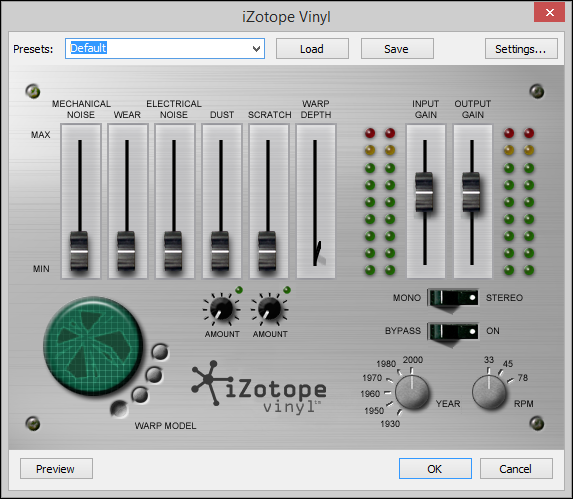 Navigate to Effect -> iZotope Vinyl in the menu bar. What we’d strongly recommend doing is immediately hitting the “Preview” button down in the corner. This will play the first five seconds or so of your recording as it currently is (with no effects applied). Listen to that little clip a few times in a row to serve as your baseline and calibrate your ear to what things sound like without any filters applied. Once you’ve got a good sense of what everything sounds like in an unfiltered state, then you can start messing with the presets and manually adjusting the effects. The filter does a really fantastic job emulating the effects of vinyl and turntables as a medium. When you’re done tinkering and tweaking you can save your custom settings with the “Save” button up at the top and then click “OK” to apply the effect to the currently open audio file. If you like how it all sounds, File -> Save it (making sure to save a copy and not overwrite your original file) and you’re in business. Armed with the above techniques you have multiple ways of introducing some fun vintage turntable sounds into your music both temporarily and, if you so desire, permanently into your music.